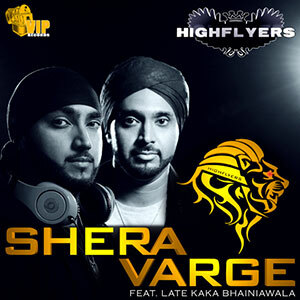 After the success of their previous single ‘Aaja Hun’ (featuring Jaswant Heera), HIGHFLYERS are ready to unleash their brand new single ‘Shera Varge’, the second single from their forthcoming 2nd album. ‘Shera Varge’ features the energetic vocals of the Late Kaka Bhainiawala, and was written by Bhinder Khanpuri. The sound is full of power and drive, featuring strong percussion and traditional instruments to give an uplifting and motivating feel to the listener. Highflyers have previously produced very successful tracks featuring the vocals of Kaka Bhainiawala, ‘Baa Farke’, & ‘Daru Naal Yaari’. Due to this collaboration, Highflyers believe they have taken his vocals and their music production one step further. The video for the track features the epic journey of a Thai Boxer, training hard with extreme focus. The main aim of the video is to inspire the youth of today to follow through passionately in what they strongly want to achieve during their journey in life, to never give up and keep moving forward. The track will be released on Thursday 5th December 2013 under VIP Records and will be available to purchase on iTunes and all other trusted digital retail stores.